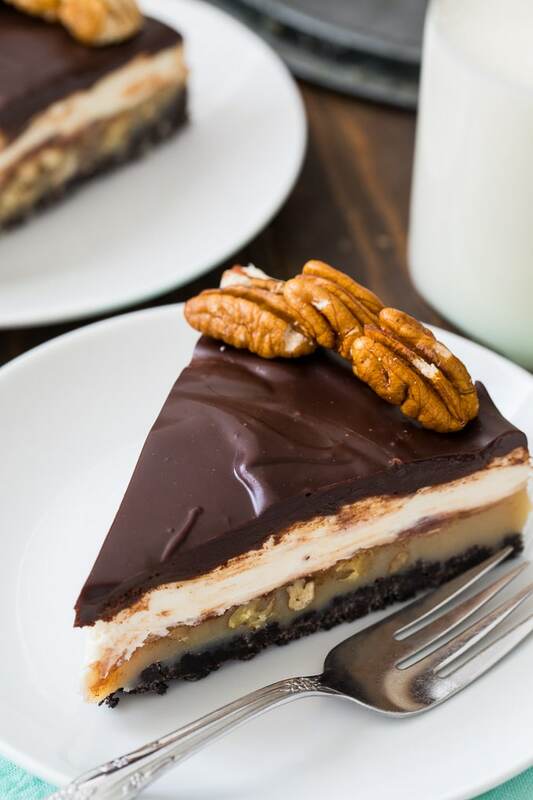 Praline Cream Cheese Pie has an oreo crust, a praline layer full of pecans, a creamy cream cheese layer, and a chocolate ganache. Four layers of deliciousness! This is one rich dessert. A little goes a long way. Plan on having some time for making this incredible southern dessert. There’s a little bit of wait time between making the layers. For a special occasion or Christmas dessert or Mardi Gras party, it is time well spent. 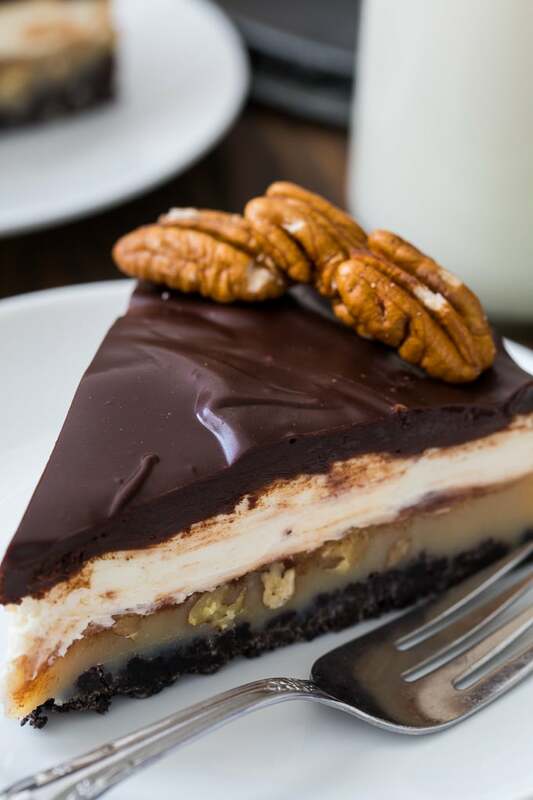 You won’t find a more decadent dessert and that praline flavor is killer. Each layer is easy to make. First a basic oreo crust. Then a praline layer is made on the stovetop with butter, light brown sugar, vanilla, and pecans. Once poured over the crust, it needs to be refrigerated for 1 to 2 hours before you add the cream cheese layer. Then that layer needs to be chilled before you add the chocolate layer. A whole lot of waiting but one bite and you’ll be hooked. 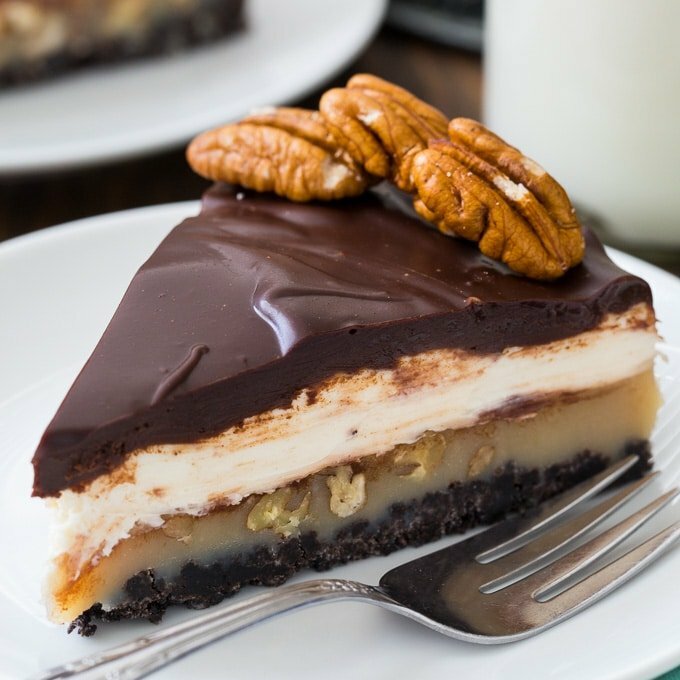 Praline Cream Cheese Pie has an oreo crust, a praline layer full of pecans,, a creamy cream cheese layer, and a chocolate ganache. Four layers of deliciousness! This is one rich dessert. Preheat oven to 350 degrees. Combine oreo cookie crumbs and melted butter in a medium bowl. Press into the bottom of a 9-inch springform pan. Bake for 10 minutes. Let cool. Sprinkle pecans on top of crust. Remove from heat. Stir in vanilla. Let it cool 2 to 3 minutes and then pour over pecans. Place in refrigerator until set, about 1 to 2 hours. Make cream cheese filling. Use an electric mixer to beat all filling ingredients until smooth. Spread over praline layer and refrigerate for 1 to 2 hours. Make ganache. Place chocolate chips and cream in a microwave-safe bowl. Microwave 30 seconds. Stir. Microwave 20 seconds and stir until smooth. Pour over cream cheese layer. Refrigerate 1 to 2 hours. Garnish with whole pecans if desired. This entry was posted in Pies and Tarts and tagged Mardi Gras, pecans, Praline. Bookmark the permalink. Very simple to make, just time consuming. Everyone loved it though. Mmmmmm. Huge hit. Christin,,,,I may pass out if I eat this but love it ,,,,,looks so good and creamy.